Peaches and raspberries are best buddies and make the perfect summer pies. Look to this Peach & Raspberry Grilled Pie when you don't want to turn on your oven...they're baked right on the grill. For peach melba grilled pie, use pure almond extract instead of the vanilla and top your pies with whipped cream. Prepare grill for indirect grilling, heating one side to medium-high and keeping the other side unlit. Combine 1 tsp. brown sugar and cinnamon in a bowl; toss with peaches to coat. Grill peaches over direct heat, 2 minutes per side. Dice half the peaches into ½-inch pieces; set aside remaining peach slices. Combine 3 Tbsp. brown sugar and flour in a bowl; fold in diced peaches, &frac13; cup raspberries, zest, melted butter, and vanilla. Place fruit filling on half of each crust. Lightly brush edges of crust with water. Fold crust in half to cover filling, creating a triangle. Seal edges of crust with a fork. Coat outsides of pies with softened butter. Wrap pies in aluminum foil. Grill pies over direct heat, covered, 5–6 minutes per side. 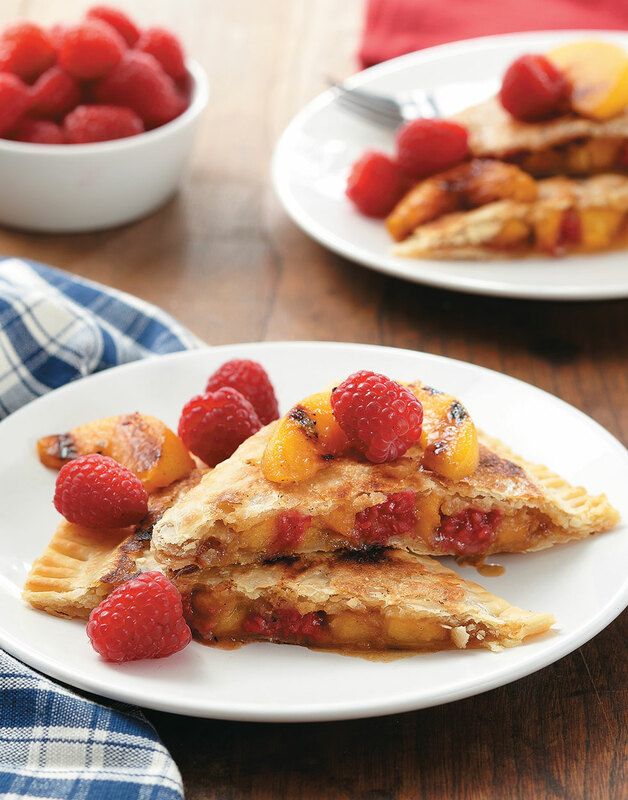 Serve pies with reserved peach slices and remaining ½ cup raspberries.